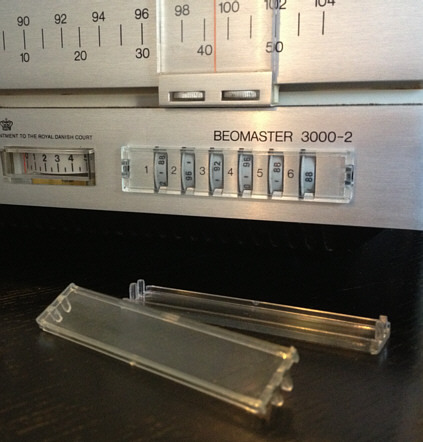 Beomaster 3000 4000 4400 Preset cover window. You are looking at the little window covering the fingerwheel presets for the FM tuning on several Bang & Olufsen 1970s stereo receivers. This part will fit Beomaster 3000, Beomaster 3000-2, Beomaster 4000, Beomaster 4400, Beomaster 4401 and the combined system Beocenter 3500. Being an important esthetic part of their design, the lovely pieces that these stereo receivers are simply wouldn’t look right without it. it has most likely deformed to some extent and turned so brittle that it will break or shatter if dropped on the floor or not handled with the utmost care. The part was long out of production and has been unavailable for ages. The new part is UV-safe, which means that it won’t discolor, fog or become brittle even if exposed to years of sunlight. The new part is made of a much stronger material and is practically unbreakable (unless you REALLY try). The photo is of the new part.